I am a solo Highland Bagpiper with over 30 years of playing experience and a former Pipe Major of a civilian pipe band. I have played at many events over the years including weddings, festivals, carnivals, parades, New Years Eve celebrations, birthday parties to name but a few. I am based in the North East of England. I am a very out going person with a great sense of humour and very professional, available for all events. The sound of the pipes can bring a sense of dignity to any occasion as well as adding a visual spectacle to the proceedings. 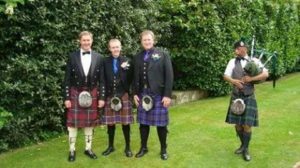 Pipers often play at weddings and not just in Scotland. 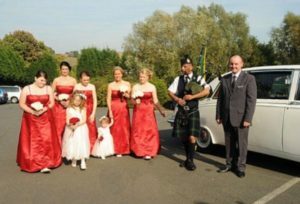 Having a piper play at your wedding will add a touch of class to the proceedings. So what exactly does a piper do at a wedding you may wonder. Below is a list of the services i offer clients for their wedding day. 1) Pipe the Bride, the mother or father of the Bride and the Bridesmaids out of her residence as she leaves to go to the wedding venue. 2) Stand outside the wedding venue and play as the guests arrive. 3) Play at the venue to announce the arrival of the Bride. 4) Play the Bride into the wedding venue and up the aisle if the venue is a church. 5) Play the Bride, Groom and guests out of the wedding venue. 6) Play the Bride, Groom and guests into the Reception Venue. 7) Play the Bride and Groom to the top table. Depending on what you require of me for your Wedding Day I can tailor my services to your requirements.